Hand held Stick flags: 4"x6" / 6"x10" / 12"x18"
70D Nylon Flags: 18"x36" / 27"x54"
Tough-tex Sewn Flags: 27"x54" / 36"x72"
We also have Acadian flag decals, keychains, and pins available at our store. Looking for Acadian flag pennant strings? Pennant strings are perfect for indoor and outdoor events, festival, or celebrations. 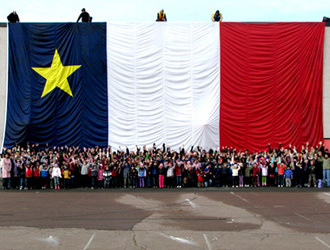 Our Acadian pennant strings are 60' long with thirty 12"x18" Acadian sewn flags. We also stock 30' Acadia pennant strings, made of 100% polyester, available for purchase online. 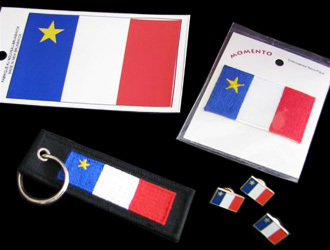 Ask us about other Acadian flag products. Contact The Flag Shop New Brunswick for more information. If you can't find Acadian flags in the size or fabric that you are looking for, we can also custom print or sew Acadian flags according to your specifications. Contact The Flag Shop New Brunswick today to receive a quote. Stick Flags: 4"x6" / 6"x10" / 12"x18"
70D Nylon Flags: 12"x24" / 18"x36" / 27"x54" / 45"x90" / 54"x108" / 72"x144"
Poly Flags: 24"x36" / 36"x60" / 36"x72"
Tackle II Nylon Flags: 36"x72"
Vinyl Decals: 2 3/8"x4" / 3.25"x5"